Thirteen is an intriguing, innovative picture book that breaks with the usual book format conventions. Instead of a single story that progresses from page to page it consists instead of 13 stories told simultaneously through a sequence of illustrations, with a minimum of explanatory text. The stories are all told concurrently; each appear on every page and develop with each turn of the page. Rather than taking in a whole page at a time, an easier way to approach this book is to follow the individual story sequences in isolation through to their conclusions. The reader, or rather the viewer, is in this way encouraged to look at the book in an entirely new way. Even the opening page is innovative. We're given a list of contents in the form of story titles that are nowhere else identified. The reader is left to figure out for themselves which title belongs to which image sequence. Some, like “The Mystery of the Pyramid” are self evident. Others not so much. The charming sequence of “The Leaf and the Caterpillar” is tucked down at the bottom of the page where it can be easily overlooked. 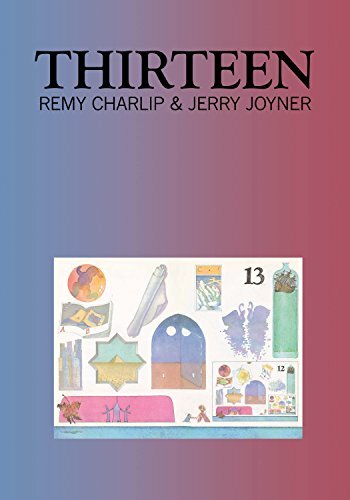 With the exception of “Paper Magic,” each sequence is the creation of either Remy Charlip or of Jerry Joiner and each follows a logical if somewhat unexpected progression. “Paper Magic,” we learn from the back cover copy, was prepared by both artists through a process of improvisation. “. . . each painted an image on a separate piece of paper. Then, trading papers, they painted a visual response to each other's images. Working alternately they passed the paper back and forth.” This may be why “Paper Magic” is the least cohesive sequence, taking bigger and bigger leaps, as though we're skipping a few pages. The bottom right corner on each page, described as “a preview of coming attractions” shows the following page in miniature and seems like a poor use of space that could have been used instead to give us one or two more stories. The page numbering, like everything else in the book, is not what you'd expect. Instead of 1, 2, 3 it's a countdown, starting at 13 and going down to 1. All text is uppercase. If this is part of the book's insistence on being different in every possible regard, it's an unfortunate choice, because it makes longer passages like the back cover and flap copy more difficult to read. Thirteen is a picture book by highly creative people that introduces us to a new way of ordering a book's content. It will intrigue not only the child audience for whom it's intended but also adults looking for creative stimulation. The endorsements (on the front flap) by author Brian Selznick and dancer John Heginbotham testify that this book has been an important inspiration to them, as it will be to many creative people. But Thirteen is not for everyone. The more conventionally minded who prefer to play by the rules and don't wish to step outside the box may find this book requires altogether too much effort to interpret. The book's claim (also on the front flap) that “in thirteen illustrated stories . . . nothing less than the birth of the world, its duration, death, and rebirth occur in thirteen arresting and evolving tableaus that linger long after the last page” seems a hyperbolic overstatement of the book's content. But perhaps this reviewer is not thinking outside the box.